Hermann von Helmholtz (1821-1894) was a pioneer scientist and polymath who had great influence over nineteenth century research and ideas in medicine, physiology, physics, psychology, philosophy, and aesthetics. Of relevance to painting is his work on visual perception, colour vision in particular, and optical aspects of painting. 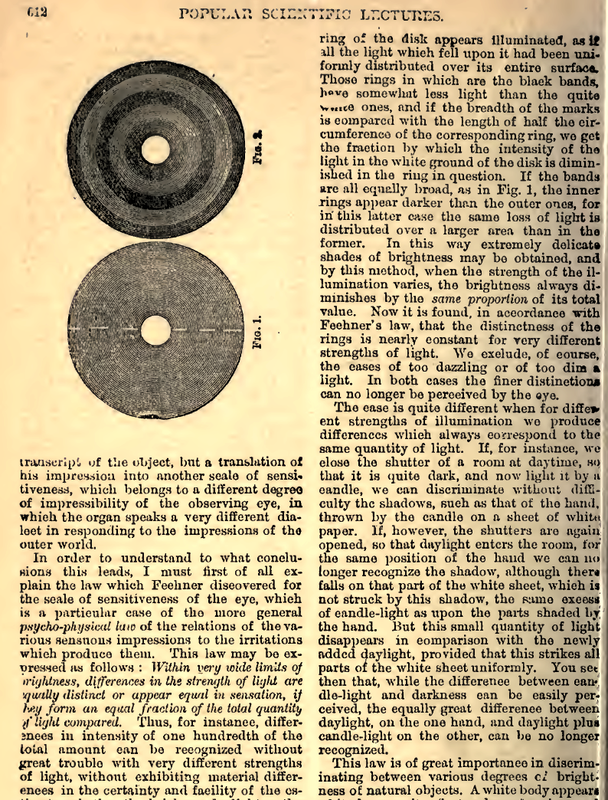 The latter were delivered in their most accessible form in his published lecture “On the relation of optics to painting”, which first appeared in his native German in 1871, in French in 1878, and in English in 1881. He was awarded the French Legion of Honour by presidential decree in 1881, alongside Alexander Graham Bell and Thomas Edison. His rationale for mentioning translation into another scale is clear from the preceding discussion about light intensity and painted tone (or ‘values’ in painters’ jargon). Human eyes are capable of seeing accurate form and colour across a huge range of light intensities, from the dazzling brightness of noon in the desert, to the depths of a moonlit night. Paint and paintings have a much narrower range of tones/values, so for the painter to convey a faithful representation of any given scene, they have to remap the light intensities in the motif to the tones which they can accomplish in their painting. Helmholtz’s lecture on the Relation of Optics to Painting was an example of scientific rationalism. But Helmholtz goes further, in recognising the effects of ambient light intensity on the optical perception of the painter, referring for instance to the ‘fatigue’ which results from exposure to high intensities in the desert at noon. He also explains the impact of Fechner’s Law,* and deviations from it at high and low levels of brightness. He thus recognises a more complex and individual perceptive scaling which must take place during the process of painting. This is quite different from Reynolds and Constable, who were happy to move trees around in order to obtain perfect composition. So many words have been written about Impressionism over the last 140 years that it is hard to know where to start in trying to comprehend where the movement stood in relation to Helmholtz, Reynolds, or truth in painting. One of the best discussions of contemporary critical approaches is that in the early chapters of Richard Shiff’s book Cézanne and the End of Impressionism (University of Chicago Press, 1984). He cites three critics as commenting that landscape painting from 1870 was mimetic, in trying to depict the ‘absolute truth’ of external reality (Fromentin in 1876, Lafenestre in 1887, and Roger Marx in 1895). 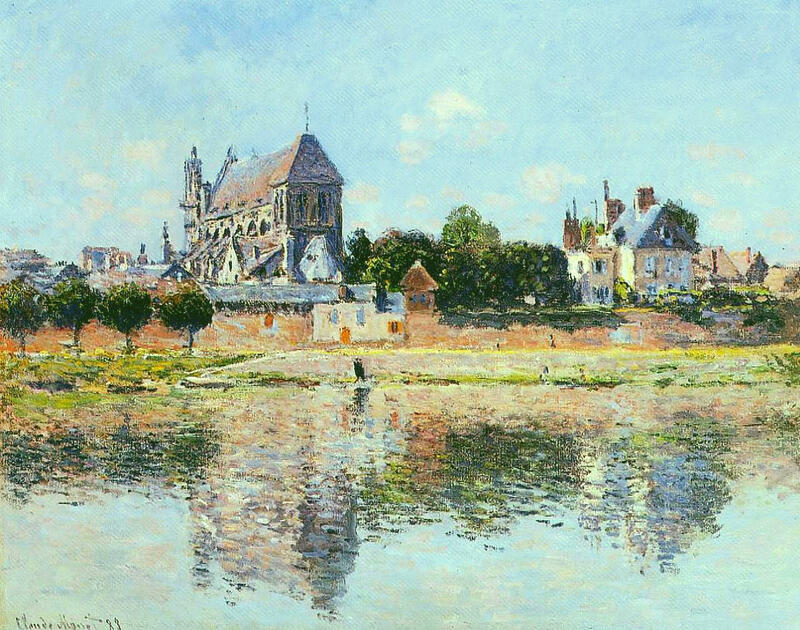 Once Monet had obtained acceptance of the critics, they described his depictions of reflections on water as ‘an absolute truth’ (Sylvester, quoted by Shiff), and Pissarro’s landscapes as exact reproductions of nature (Duret, quoted by Shiff). I offer two representative paintings here from which you can judge yourself. However Shiff, invoking then dominant positivist philosophy, divides ‘truth’ into two, subjective and objective, and is critical of those who miss this distinction. In this, mere copying or mimesis is seen once again as inferior to the creative. 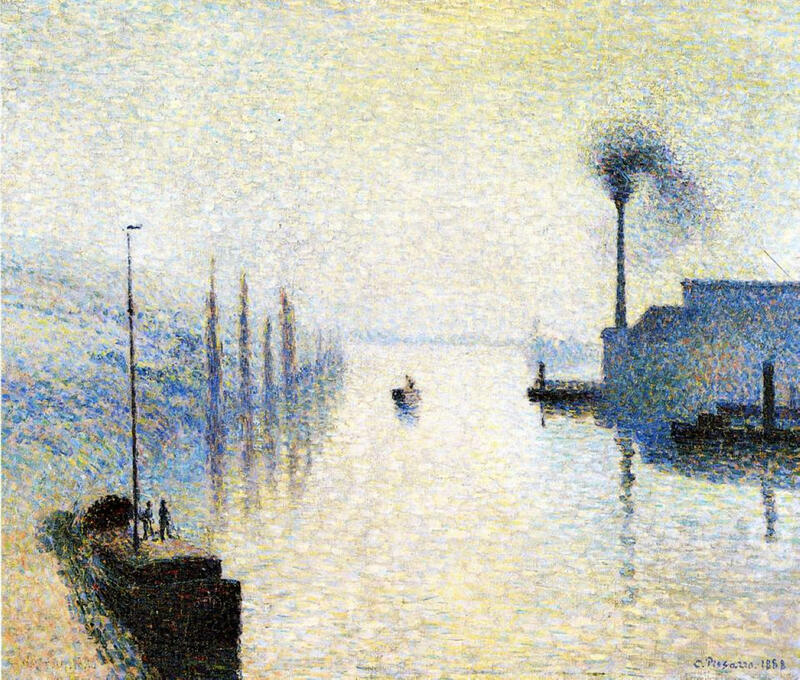 The Impressionists are then viewed as emphasising subjective experiences of nature and denying the observational detail associated with a photograph. Given the growth of photography at that time, and the fact that several of the Impressionists experimented with photography as well, this quest for subjective truth appears to be an interesting re-expression of the older views of Reynolds and Constable. I therefore think that, whilst Helmholtz’s scientific rationalism may have had some influence on the Impressionists, they too followed a course from Reynolds and Constable, and expressed a truth tempered by the desire to express something greater than mere mimesis. However the Impressionists also started to use a French word which became dominant in the limited writing of Cézanne: sensations. ** If they painted impressions, Cézanne and those who succeeded mainstream Impressionism could perhaps better be labelled as Sensationists. Claimed to be the father of Cubism, abstraction, and the deviant schools of the twentieth century, Cézanne will be the focus of my next posting in this series. * given by Helmholtz as “Within very wide limits of brightness, differences in the strength of light are equally distinct or appear equal in sensation, if they form an equal fraction of the total quantity of light compared.” However towards the upper and lower limits of brightness, Fechner’s Law no longer holds, as the eye is less sensitive to differences in light than would be expected by this law. ** in French, this word conveys meaning well beyond mere optical sensations as understood in English. Unfortunately few commentators appear any more specific over its meaning than that. Posted in Painting and tagged Constable, Impressionism, landscape, painting, positivism, realism, Reynolds, sensations, von Helmholtz. Bookmark the permalink.